When I am fusing fabrics to start a project and I know that I want to use all the fabric, I have to mend or over lap areas of the fabric that I am fusing to make sure all the fabric gets fusible web on it. This is important if you want to make sure that you don’t have any gaps in the fused areas of your fabric. I HATE it when I go to fuse something in place and there isn’t fusing on some part of the fabric. This has happened to me way too many times. 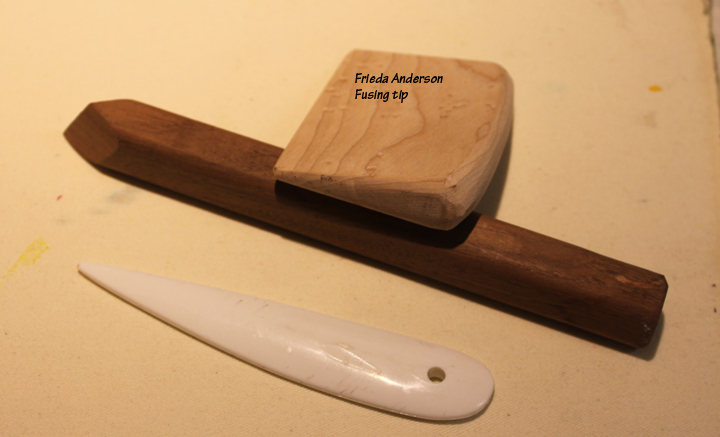 FUSING TIP of the WEEK – this is how I overlap fuse. 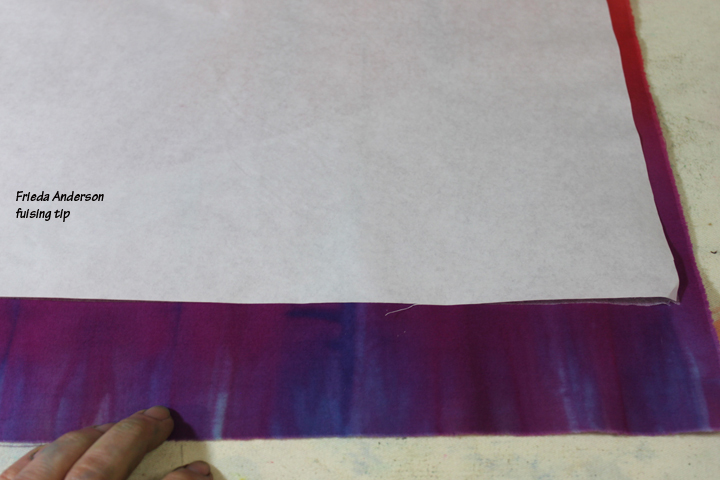 I apply the first piece of fusible web to the back of the fabric. With hand dyed fabric there is no right or wrong side of fabric. You should always pre-wash any commercial fabrics to remove all the starch from the fabric before fusing it. Always use a hot dry iron when you are fusing and then let the fused fabric cool before peeling up or using the fused fabric. 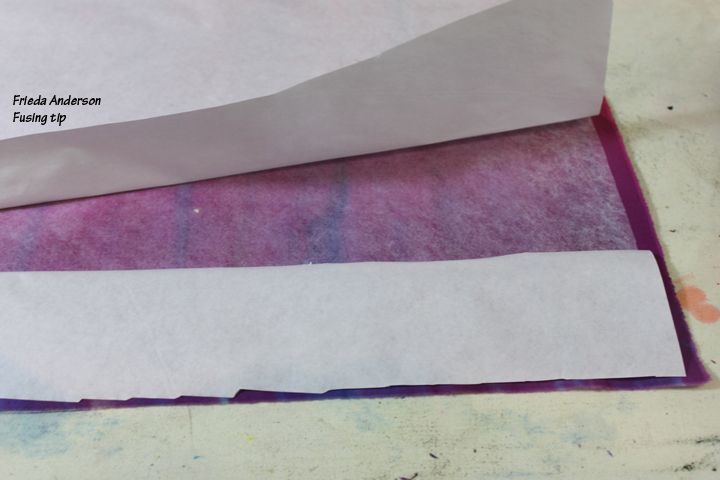 Once it has cooled down I peel the paper off of the fused fabric, but just part way. Then I lay a piece of cut fusible to fit over the next area, making sure that a little bit of the fusibles overlap each other. And if I am really patching the fusible I can even peel the fusible away from the paper before I fuse it down, let it lay on the fabric and then place another piece of fusible so it is also over lapping. I let the paper from the first and second piece of fusibles lay down and fuse it all toghether. 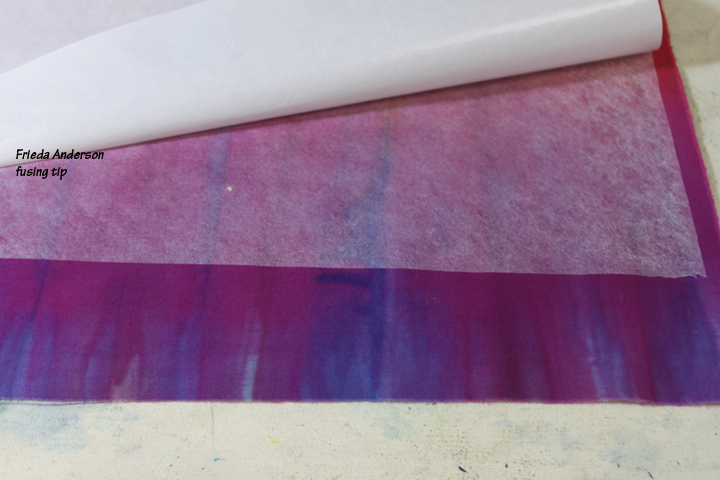 It is very hard to OVER fuse your fusible in these first stages of fusing to the fabric. 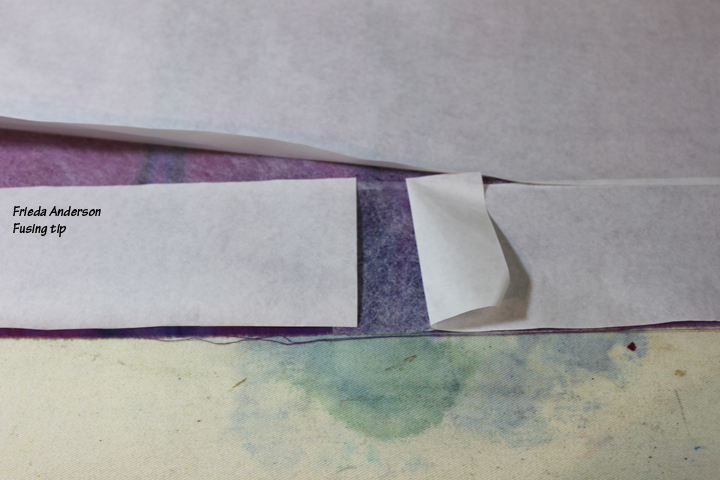 The reason that I like to “mend” this way is so that there is no fusible on the top of the paper backing. 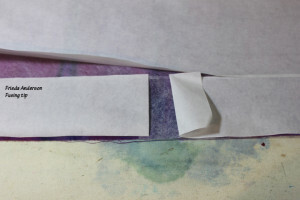 Then when I peel off all the paper to start using the fusible I can reuse the “release” paper and it also wouldn’t peel off and leave some area exposed. Now I don’t have any areas that don’t have fusible on them and before I start to fuse I remove all the paper and trim the edges so that no BARE fabric is left. I’ll show you next week how I use these tools. You’re welcome. I think it is a great tip too. It has saved me a lot of heart ache!! 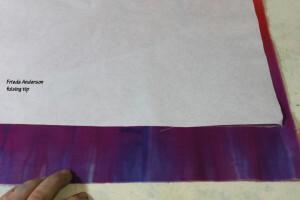 This is a great way to use up all of your scraps of fusible. I tried it and it worked great. Thank you.